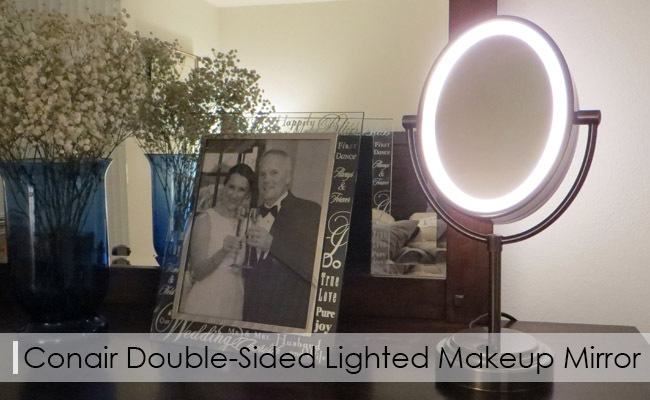 What makes the Conair Double-Sided Lighted Makeup Mirror so special? What’s to highlight about its build and features? Getting a vanity mirror isn’t difficult these days. Getting a good vanity mirror that doesn’t just give you clarity, but also magnification for better work on the smallest details, is another thing and finding the right option for your budget can become quite a challenge. Luckily for all of us, the market gives us not only reliable options, but also good choices that don’t cost us an arm and a leg. Not only is the Double-sided mirror from Conair priced fairly, but it’s also a double-sided model that gives you both clarity and precise magnification for achieving the perfect look. The lighted mirror creates a nice first impression and its oval design has an elegant feel to it. Easy to use, reliable and affordable, the Conair double-sided lighted mirror isn’t the model that you’d want to skip on. The oval design and the polished chrome finish do catch your attention, but the mirror is more than meets the eye. The mirror has just the right size and height for most, so you shouldn’t worry about not being able to see your whole face in it. It’s 7x9in. big and doesn’t take much space on any counter top either. The 7x magnification helps you work even closer and better on the details. You can see (are you ready for it) all the smallest good and bad things on your skin. It’s easier to define your brows with the magnification or get that perfect cat line that you’ve always wanted to achieve. The light on the mirror is a warm yellow light that is great for the natural makeup. The soft halo lighting is pleasant and gives an incandescent glow. The mirror uses incandescent bulbs and you’re not going to need to replace it any time soon. The mirror is well made and has a durability feel to it. Even though it’s not heavyweight, it may not be the perfect choice for travelling. Corded, the mirror comes with an electrical outlet at the base. It gets warm, but never to the point of being uncomfortable to touch. The frame of the mirror is made of metal, whereas the base is made of plastic material. However, you shouldn’t worry about the durability or the stability of the mirror. The base is wide and has just the right weight for good stability. The polished chrome finish and the oval design helps it pop out in any décor, but it’s always in a good way. The mirror is corded so you only need to plug it in, with no worries about running out on batteries. The on/off line cord switch makes operation easy and the mirror requires no assembly whatsoever. Due to its adjustability, you can easily adjust it to any angle for better viewing. The magnification side is also easy to operate and the mirror is no brainer altogether. Due to its right size, you’re not going to find it difficult to set it up for seeing your entire face. The bulb is replaceable and that’s not difficult to do either. Reliable, elegantly looking and versatile, the double-sided lighted mirror is a great choice for any makeup enthusiastic that goes shopping on a tight budget. The magnification is accurate, the use is easy and the looks is quite nice. What’s not to like? 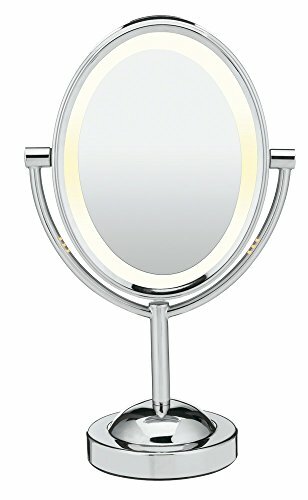 Other related reviews: Chende Professional Mirror, Jerdon HL65BZ Mirror, Magnifying Mirror by Upper West Collection, Jerdon JGL9W Two-Sided Mirror.